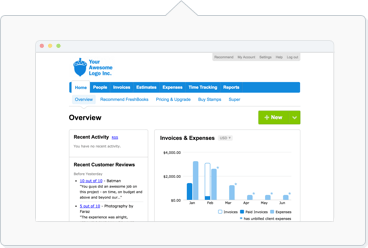 Working with others in FreshBooks is as easy as inviting them to join your account. Keep productivity and collaboration going by inviting your team member as either a Basic Employee, Business Partner, Contractor or an Accountant. Comes with full access. Business Partners are those you consider key decision makers that need access to your account. They can be co-owners, partners, or even secondary admins for example. Comes with limited access. Basic Employees are useful if you have team members helping you manage aspects of your business, like tracking time and expenses, but don’t need full access. Comes with a separate FreshBooks account. Contractors also get shared information like Projects you’ve invited them to. Contractors are useful if you only need them to track their time and Invoice for it after. Comes with limited access. Accountants are ideal for your bookkeeper or accountant to help you with ensuring your business' health like reviewing your financial reports and balancing books without needing full access to your entire account. You can invite up to 10 Accountants per business, on Plus and Premium plans. Tip: If you need to know what each set of permissions can or can’t access, check out this handy table here. Then click Send Invitation. Your team member will receive an email with instructions to log in. Then click Save to finish your changes to the Project. An email will automatically be sent. Once you've invited your team member, feel free to send them a link to their Getting Started guide here.